They say that a week is a long time in football, by that logic 18 months seem like an eon. It has been that long since Newcastle United last made a permanent signing, and in doing so becoming the first club not to make a permanent signing in a full Premier League season. One man who would be somewhat miffed and I guess slightly upset with that fact is the club chief scout Graham Carr. The 69 year old has had to travel far and wide to identify players for the Magpies only to find out that the club just simply don’t seem interested in signing anyone to push on. Geordie born Carr who has been lauded for recommending players like Yohan Cabaye, Hatem Ben Arfa, Cheick Tiote and Davide Santon has been rendered rather useless by some of the transfer strategy employed by the club. There have been assurances by the club through various sources that they will spend money this summer to bolster a depleted squad to compete but looking at some of the players that have been linked in the last few weeks they hardly look like recommendations that Carr would have made. Darren Bent, Micah Richards and Saido Berahino are some of the players that have been linked and they all come across as players who manager Alan Pardew would want to have at his disposal. Pardew has made no secret of the fact that he would like to have more British players at his disposal and may be that is what media is playing at with their stories. The more British players come in through the door at the club one can safely assume that it is a Pardew recommended player than one suggested by the chief scout. Normally it would not be even worth mentioning as to whether it is the manager or someone else that suggests players to be brought in but there has been a lot of bad blood between Alan Pardew and Graham Carr. It was revealed last year that Joe Kinnear was brought in as Director of football to settle a feud between the two. “There is a stand-off between Carr and Pardew. There was hardly any communication between them towards the end of last season and there is little now. “Both are on massive contracts. Carr is stabbing Pardew in the back, and vice versa. Add to this the fact that Kinnear cancelled the transfers of Douglas from FC Twente and William Vainqueur from Standard Liege who had both agreed to join the club on a free. Those two would typically be Carr’s recommendations. 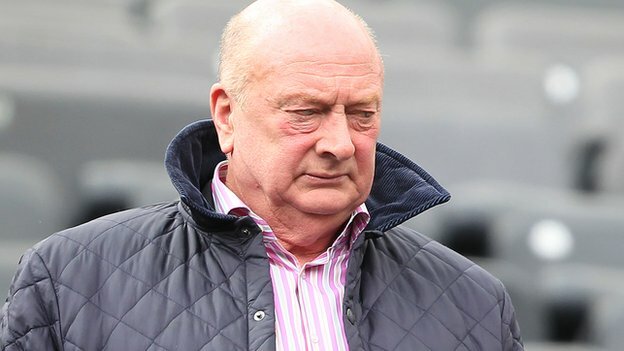 It was also revealed in an article last year that Carr who signed an eight year deal in June 2012 was willing to resign from his position only to be persuaded by club owner Mike Ashley to carry on. In the last two seasons Newcastle United have lost 38 games in the Premier League and that is a loss rate of 50%. Through his team selections and various interviews Pardew has suggested that the players at his disposal have not been good enough. Majority of the fans on the other hand think it is down to the limitations of management and coaching staff and I tend to agree with them. Also add to this the fact fifth place position that the Magpies achieved in 2011-12 was largely down to the same players. If Pardew is allowed to bring in the players that he wants, considering his record at Newcastle and previous clubs, Gabriel Obertan, Hayden Mullins, and Marlon Harewood to name a few, you seriously have to ask whether he is being compromised in his role at the club. 4 Comments on Is Graham Carr being compromised at Newcastle? A club source really??? I saw them together less then a week ago, bad blood, daggers drawn , not a chance. Sorry but this is mere speculation from someone with a huge anti Pardew agenda. Yes I think Carr is being very badly let down. Pardew is a very demoralising and frustrating influence on fans, players and coaches alike. Not someone you would want to work with or trust. Tragically Ashley has a blind spot where Pardew is concerned so the misery continues. Not many people left without an anti Pardew agenda now their eyes have been well and truly opened to the man’s limitations. Wow cant be many of those about ?.